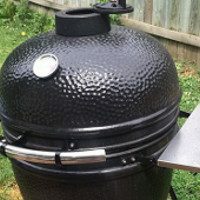 If you’ve seen our Facebook page in the last year, it focuses on kamado grilling on the Saffire. It is loaded with beautiful posts for wonderful meals cooked on every size and class of Saffire Grills. 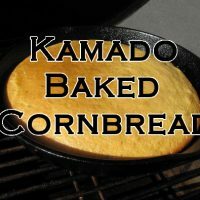 We modified this recipe from a cook done by Saffire’s own Southeastern Territory Manager, Pete Lee. Pete has almost 40 years BBQ Grilling experience. He is Saffire’s Road Show and Demo Training Program master, and is also a SCBA (South Carolina Barbecue Association) certified judge. Pete gets has his bone in angus loin steaks cut by his local butcher. They measure 1 and 1/4 thick. When I asked him why, he offered what is possibly the most poignant piece of advice I’d heard on grilling steak, “The thicker the steak, the better the cook.” He cooked this meal on his Large Platinum Blue Saffire Grill. Fire up your grill – preferably with Saffire’s All Natural North American Hardwood Lump Charcoal to 325 degrees (heat deflector optional). Wrap the potatoes in foil and place on the primary grid. Cut the butter into 12 slices and halve them. In a 8×8 casserole dish, layer the vegetables, Mushrooms first topped with 8 pieces of butter, then shallots topped with 8 more pieces of butter, then the broccoli sliced and layered evenly with the remaining butter on top. Season each layer with cracked pepper, salt, and garlic. Drizzle olive oil on top and place the bell peppers. Cover the casserole dish with foil. Remove the veggies and put them aside to rest. If you are using the heat deflector, remove it. Increase your temperature to 500-525 degrees and add the steaks to the primary grid. If the potatoes aren’t quite done, leave them on the secondary grid. Sear 4-5 minutes per side. If you want pretty grill marks, at the half before the turn (2-2.5 minutes) quarter turn the steaks. If the potatoes are still on the secondary grid at the turn, check them. Remove when they are finished.